The comebacks of Serena and Venus Williams were cut short today with fourth round losses at their second tournament back since injury layoffs. For Serena, the Centre Court defeat came at the hands of Marion Bartoli, while Venus lost to her conqueror of last year, Tsvetana Pironkova. These relatively early exits aren’t entirely surprising. Both sisters have shone signs of struggle and rust in their returns, dodging many a close three set drama en route to the sweet 16. Should we be worried about the form of the top American prospects to hoist more Grand Slam titles? No. Remember, Serena suffered greatly to even make it to this stage, while Venus hasn’t played much more than her younger sister in the past year. If anything, it’s a surprise that the Williams’ could even make it this far. But, then again, is it? Especially with the current state of the women’s game. Caroline Wozniacki, he No. 1 seed, failed to advance from Day Seven action, too, losing to Dominika Cibulkova. The Dane has yet to win a Grand Slam title, and that disappointment will continue until who knows when. But, back to the sisters. Of course, they’re champions in the sport for a reason (countless reasons, in fact). This marks just a tiny blip in the distinguished Wimbledon careers of both. They’ve won nine out of 11 Wimbledon crowns, and they’re likely to win more going forward. How the saga continues is anyone’s guess, but that’s one of the most compellings parts about these two champions. For more of my coverage of the Williams sisters throughout this tournament and since their comebacks, check out here and here. Maria Sharapova faced a tough test against Caroline Wozniacki before advancing to the Rome final. If she can beat Sam Stosur, Sharapova will claim her first title since her 2010 Strausborg title. With the win over Wozniacki, Sharapova has solidified her head-to-head over the world number one to 3-2. She beat her 7-5, 6-3. And the drama didn’t even begin there for the 24-year old Sharapova. Her match against Victoria Azarenka in the quarterfinals proved just as nail-biting. This was the 10th time that Azarenka has retired in a match since the beginning of the 2010 season, according to a report from Tennis.com. For a video of Azarenka’s outburst, watch below. Check out another post I wrote for the blog Tennis Served Fresh about Esquire’s battle of beauty, Maria Sharapova’s new website and Indian Wells action. Is tennis (and the world) suddenly in the palm of Maria Sharapova’s hand again? 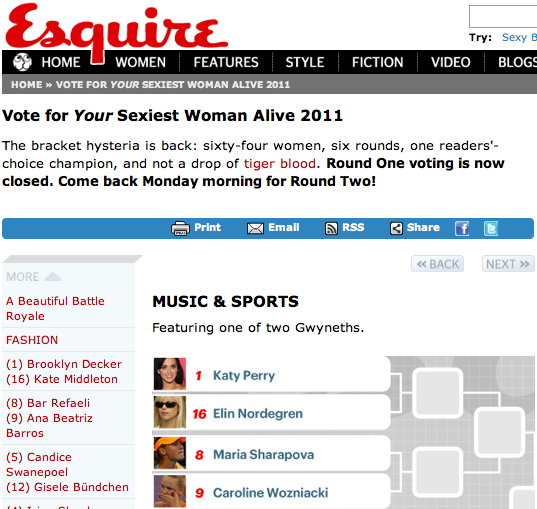 Esquire‘s battle of beauty and search for the sexiest woman alive has the web abuzz during the month of madness. In the brackets, seeded 8th, her first competition is none other than Caroline Wozniacki, the 9th seed. Step aside world no. 1 because against Masha you’re better as Miss Congeniality. Plus, it looks like Esquire’s made up its mind on which blonde to root for: “On the tennis court, we’d probably pick Wozniacki, but on whatever kind of court this competition occurs on, our hearts will always be with Sharapova.” Yeah, cuz she sells ads, y’all! Click here for Esquire’s entire bracket brilliance. Check out another post I wrote for the blog Tennis Served Fresh about Serena’s ailments, 3D Wimbledon coverage, and John McEnroe’s rising star. China’s Na Li advanced to the 2011 Australian Open final over the world number one Caroline Wozniacki in three sets. After saving a match point, she won 3-6, 7-5, 6-3. By winning, she becomes the first Chinese woman to make it to a major final. In a tense match throughout, Li continually fought from behind to come up with superb shot-making. In the third, she started hitting more freely as Wozniacki’s defenses faltered. Li, however, suffered from more than just a shaky serve before edging Wozniacki in the match, according to on-court interview after the match. Unafraid to make her husband and coach Jiang Shan the brunt of her jokes, she cited his snoring as keeping her up every hour. Despite the supposed lack of sleep the night before, however, she made the shots when it matted most. In another marital twist, there was confusion when the win was stated as marking the day of Li’s fifth marriage anniversary. That, however, was debunked. Incredulous, Li denied the claim — and the apparently incorrect media notes. Apparently, the 29th is the real date. In a moment of humor, Li said the promise of more prize money helped her save that match point during the second set, drawing raucous laughter from the crowd. We all know, of course, that it’s something much more powerful than that. With the final four women set, it’s time to revise predictions for the 2011 Australian Open tournament’s future path on WTA tour. Here’s a look at the last women standing. Previously predicting “Henin to face Venus and Clijsters against Zvonareva in the final four,” it’s been injury making this reality far from possible. While Henin suffered what she recently announced as a career-ending elbow injury (more on that to come) in the third round against Svetlana Kuznetsova, Williams retired versus Andrea Petkovic, who defeated Maria Sharapova in straight sets, in the third round, too. Of course, the competitors to advance in lieu of this two champions couldn’t be more talented. The world number one Caroline Wozniacki and last year’s semifinalist Na Li have been dominant so far in their respective runs to the final four. For the semifinals, here are my picks. Both players have hit their way to the semifinals in fine form. Wozniack dropped just one set — against Francesca Schiavone in the quarterfinals — and Li hasn’t lost one yet. Their overall career head-to-head (counting exhibitions matches) leaves them at 2-2 with Wozniacki winning the last meeting in a Hong Kong exhibition earlier this year. In a major, however, Li won their only meeting in straight sets at last year’s Australian Open in the fourth round. That should give her some confidence going in this match. Plus, she hasn’t lost a match this year, and I see her powering through the world number one to make her first major singles final. Bottom Line: Li defeats Wozniacki in straight sets to advance. In the bottom half, which I predicted correctly, the world number two and world number three will face in a rematch of the 2010 US Open final. There, Clijsters’ experience paid off. She won 6-2, 6-1. With a head-to-head also in Clijsters’ favor at 6-3, they have played a number of three set matches together. Although not at their highest level throughout this tournament, Clijsters hasn’t dropped a set and Zvonareva lost only one in her match versus an up-and-coming Bojana Jovanovski. They’ll both bring their big games to the semifinals where Clijsters will find the form that has won her three US Open titles. Bottom Line: Clijsters beats Zvonareva in straight sets. Clijsters and Li have a competitive history in their past, which should show in the Australian Open final. Li beat the Belgian in their last meeting earlier this year in the Sydney final although it initially seemed that Clijsters was in control. It will, however, be her first Grand Slam final. It’s been an intense few days at the Australian Open with chaos and comedy abound. Agnieszka Radwanska’s racket snaps (see below), Kim Clijsters jokes about pregnancy with Tom Woodbridge, last year’s finalist Justine Henin bows out to Svetlana Kuznetsova in a straight sets upset, and much more. To begin, a dead spot was found on Hisense Arena as Maria Sharapova and Julia Goerges got ready to start play. With tournament staff in a frenzy, the players retreated back to the locker room, awaiting a fix to the curious on-court dilemma. It all came across pretty comical as none of the ESPN commentators could quite figure out what to make of the ball, which — when dropped — died completely. In the end, however, workers drilled small holes, trapped air was released from the court, balls bounced once more, and play resumed. See below for a clip of the ball being dropped, and not bouncing at all.